Please feel free to contact Newline for frendly and impartial advice. Newline is a residential care home for elderly people aged 65 and over. Newline provides accommodation, meals, care and support for those who are finding it difficult to cope at home by themselves or those who need more help and assistance than their carer at home is able to provide. We provide 24 hour personal and practical care in safe, friendly and homely surroundings. This includes help and assistance with everyday routines such as getting up or going to bed, dressing, bathing and taking medication, what ever their need we are here to help. And if from time to time our residents need a little bit more help than usual, for instance if they are unwell we are there on hand to take care of them. It is our aim is to be there for our residents to assist but not interfere, therefore we develop personalised care plans that are tailored to their individual needs and capabilities. These are continually reviewed to ensure that the correct level of care and assistance is being provided at all times. We do not provide nursing care however we do work very closely with local doctors and district nurses to provide comprehensive care to our residents. Newline care home offers our residents the chance to be part of a community. We encourage all our residents to socialise and interact with each other and our staff in the communal lounge and dining room, and take part in our daily activities. However if they wish to relax and take time out in their own room they know we are on hand should they require anything. At Newline we like to think that our residents see it as their home and our staff as an extension of their friends and relatives. Friends and relatives are welcomed at Newline and are play a vital role in how we deliver care to our residents, and as such we put no restrictions on visiting. We encourage feedback from friends and relatives and participation in the development of care plans. 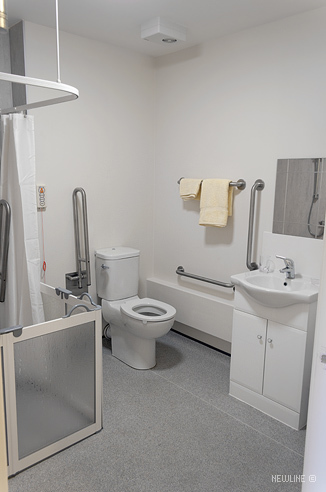 We appreciate that often the decision to use a residential home is sudden and very difficult one to make, but know we are here to help every step of the way. So if you wish to visit the care home or would like some help and advice please to not hesitate to contact us. If you decide that Newline Care Home is right for you or your relative then we will carry out an assessment to ensure we can meet your needs and provide the correct type and level of care. We will liase with you and all relevant parties such as the social worker or hospital to arrange a suitable room and moving date. We offer a 4 week settling in period to ensure that we are able to offer the correct care and that any new resident is happy at Newline. It can often be slightly unsettling for any new residents but within a short space of time they do settle in and think of Newline as their home. Our staff do everything possible to ensure that new residents settle in as quickly as possible and are happy and content. We also provide short term care at Newline Care Home, this is often used in order to give carers a break or if no carer is available for a short space of time. This can be used from as little as 1 week to several weeks. It provides peace of mind for the carer knowing that there loved one is in a safe, friendly and homely environment receiving all the care they need, allowing the carer to take a well deserved break. On many an occasion we have found those who initially planned to stay for respite care only find it both a pleasant experience and suited to their needs that they decide to make Newline their permenant home. If you would like to find out more about the option of respite care or pre-book a respite stay please contact Penny Yates, Manager. If the need arises to care for a resident with chronic and terminal illness we do so with upmost compassion. We will always endeavour to keep the resident in the familiar surroundings of the care home with staff who know them best. We work closely with the local health care professionals to ensure we meet all their care requirements. Ensuring that the last period of their life is as comfortable as possible offering the reassurance and support their friends and relatives need at this difficult time. In recent years newline has expanded its services to offer the highest level of quality care we provide in the care home to those in their own homes within the local community. Anewline Homecare Services offers domiciliary care to clients with a wide range of needs including elderly, young disabled, people with learning difficulties and those people chronic or terminal illness who wish to remain in their own home. Anewline provides a full range of services including assistance with personal care, domestic tasks and outings. Our staff are well trained, highly skilled and reliable offering the support and reassurance for people to remain in their own homes for as long as is appropriate. For more information on how we can assist you in your own home please contact Tracey Yeadon, Director of Care.